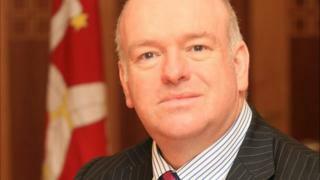 Attempts to make the Isle of Man reveal who owns company assets on the island are "unenforceable", the chief minister has told Tynwald. A proposed amendment to a UK bill on financial services would have obliged the Crown dependencies to create "public beneficial ownership registers" by 2020. The House of Commons debate was dropped on Monday ahead of a likely defeat. Chief Minister Howard Quayle gave his reaction in the House of Keys. He said the Manx government would "strongly resist any attempt to undermine" the island's "longstanding democracy". He complained that the UK had neither consulted nor obtained the consent of the Manx government. As such, Westminster's plans "were unconstitutional, unworkable and, in the opinion of our government, unenforceable", Mr Quayle said. The Isle of Man introduced a private beneficial ownership register for companies in 2017, and information from the Manx register can be accessed by those investigating suspected money laundering and tax evasion within 24 hours, or one hour if urgently requested in relation to a terrorist concern. People in the UK can access information about who owns company assets, but only law enforcement and tax authorities can access the same information in the Isle of Man. Manx lawyer Paul Beckett said the amendment was a "bolt on" to a bill which had "nothing to do" with the Crown dependencies. "Constitutionally, the United Kingdom parliament cannot legislate for the island without our consent," Mr Beckett said. The UK has a public register of who controls and benefits from companies in the country. Overseas territories will be obliged to make the same information publically available by 2020. The amendment had the support of more than 40 MPs, including Labour's Margaret Hodge who, along with Tory MP Andrew Mitchell, has campaigned for transparency for some time. Writing on social media after the Financial Services Bill was pulled from Monday's sitting of the House of Commons, Margaret Hodge described the move as "outrageous" and said MPs would "continue to campaign for public registers". The bill is now likely to be debated by the House of Commons by the end of the month. Mr Quayle said the deferral would allow the Manx government to "undertake real and meaningful engagement" with its UK counterpart over the issue.